A business card is an essential part of doing business. If your business is selling real property, you will want to consider ordering some real estate business cards with photo and background. There are a number of reasons why this form of advertising makes good business sense. Business cards are a way of introducing yourself to new and potential clients. A number of people have trouble remembering a person's name after being introduced, even after spending time with that person. The real estate agent presents his or her card at the beginning of the meeting; the other person is left with the agent's name and contact information when the meeting is finished. Even if the potential client does not choose to proceed with the purchase or sale of a house or land at that time, they have a contact person to go to should their needs change in the future. A lot of people save business cards from people they have met for a later time. It is more convenient for them to call someone they are already acquainted with. Real estate agents have a special relationship with their clients. In order for a real estate agent to do his or her job well, they need to understand their clients well. Buying a house is more complicated than deciding on what price range one can afford. It's about balancing what one wants (wish list) and what one needs (practical considerations). The role of the real estate agent is to help his or her client find a home or property with features they need and as many items from the wish list as possible. They deal with confidential information received from clients and negotiate on their clients' behalf. 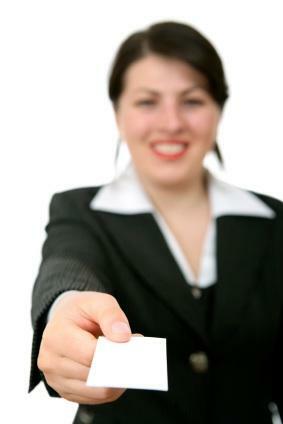 A successful real estate agent is trustworthy. Photos added to business cards can be anything from simple head shots to full-length images. Most people choose to include a color photo. For an image that will be on your business card, it would be best to spend the money to have a professional photographer take the picture. For the photo session, wear an outfit that you really like. Men should wear a business suit and tie; women can wear a suit or a dress. Avoid clingy or v-neck sweaters - they don't present a professional image. Business cards can be ordered from a local printer. Check ads in the Yellow Pages to see which ones produce business cards. The staff at the print shop will have samples for you to look at or you can work with them to design custom business cards. Ordering business cards online is another option. You can choose from samples posted on the website or have custom cards made. Business cards are available in a number of colors and offers the additional option of having both sides printed.